Warning: When I was looking for my first schnauzer puppy, Roodewal Kennels was happy to meet me on the highway straight away, and hand over a schnauzer puppy with no questions asked as to where it was going or about myself or why I wanted a schnauzer. You need to wonder why they had no regard for the puppies future home, and also how come they have schnauzer puppies on tap and no waiting list. We received an email from the owner of Roodewal Kennels stating that "I have spoken to my lawyer. His advice is that I can take you to court for placing this on the website." We responded as below..... Unfortunately ALL the Schnauzer Friends emails were ignored and were never answered.... What really puzzles us is what kind of people choose to make money on out of other people and animals pain and suffering? Legally I am allowed to publish my own personal opinions regarding my own experiences on public forums. That is why there are websites like Hello Peter, Trip Advisor etc. I did not bad mouth you as a person as you say in your email. However, I don't want to fight with you and would much rather embrace you as part of our Schnauzer Friends South Africa Community. I really do hope that the various emails and discussions I have had with people are not true and that Roodewal is indeed not a puppy farm. I also hope it is untrue that people have been offered "breeding packages" from Roodewal. Warning: When I was looking for my first schnauzer puppy, one of the breeders I contacted via a glossy advert in well know animal magazine was happy to meet me on the highway straight away, and hand over a schnauzer puppy with no questions asked as to where it was going or about myself or why I wanted a schnauzer. You need to wonder why they had no regard for the puppies future home, and also how come they have schnauzer puppies on tap and no waiting list. The aim of the Schnauzer Friends South Africa Community is to better the life of ALL schnauzers and to share information of how to be a better schnauzer parent, assist rescue schnauzers, as well as have fun. I do hope that you will embrace the Schnauzer Friends South Africa Community and assist us with educating people about how to be good schnauzer parents, and how to identify puppy mills and greeders. 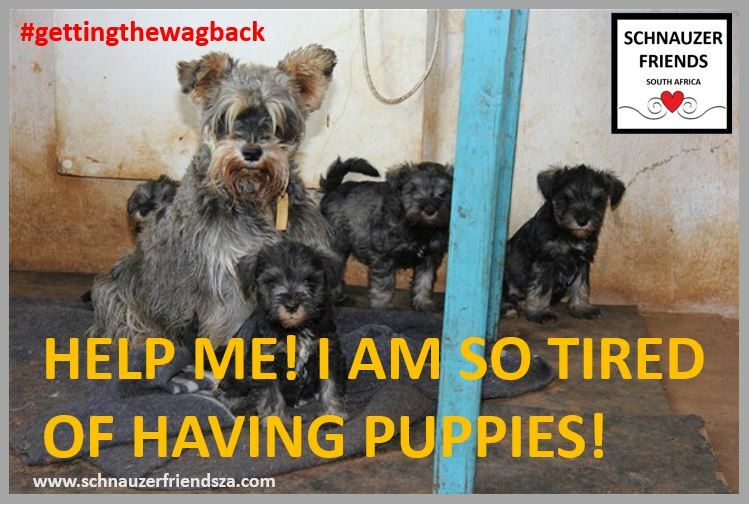 It is puppy farms and greeders who feed the Schnauzer Friends South Africa programme! Facebook:Schnauzer Friends - South Africa. As per my previous email last week, the aim of the Schnauzer Friends South Africa Community is to better the life of ALL schnauzers and to share information of how to be a better schnauzer parent, assist rescue schnauzers, as well as have fun. I do hope that you will embrace the Schnauzer Friends South Africa Community and assist us with educating people about how to be good schnauzer parents, and how to identify puppy mills and greeders. It is puppy farms and greeders who feed the Schnauzer Friends South Africa programme! Since you have been breeding schnauzer puppies since 1984 and have clarified to me that you are not a greeder, I would love some more information from you so we can continue to educate and assist people with schnauzers. Please can you let me know the following so I can assist in advising owners what to look for and we can also educate other breeders as what to do e.g. How do you ensure that your schnauzer puppies go to good homes? What kind of checks do you do and what do you look for in a prospective owner ? What vaccinations, worming etc. do they receive ? What other kind of tests do you do on your puppies before they get rehomed, to ensure no genetic illnesses etc.? At what age do you rehome your puppies? What is the minimum age? On what food do you raise your puppies ? What are the conditions in which you raise your puppies ? etc. I would like to create a guide for new schnauzer puppy owners on my website. So can you also please send me the information that you provide to buyers of your puppies ? e.g. What do you recommend for food, toilet training, grooming, walking, socialization etc. Can you read my puppies page on www.schnauzerfriendsza.com and see what you suggest I could add ? Not sure if you received my previous email or why you have not responded? Being a schnauzer breeder for over 30 years you must CARE about the schnauzer breed and want to assist in providing information to the Schnauzer Friends community in South Africa, so we can continue to educate and assist people regarding schnauzers ? As a responsible breeder it is your duty to care about the schnauzers AFTER you have bred and sold them. I have looked on your website and there is no information on nutrition, grooming, socialisation etc. or how to be a good parent to the schnauzers after people have brought a schnauzer puppy from you. I am providing an information platform for schnauzer parents. You should be the forerunner of schnauzer information. I would really appreciate your assistance in this regard. Maybe you have been busy as it has been Easter, but what I have asked for should not take you long to provide. I would like to create a guide for new schnauzer puppy owners on my website. Can you please share with me the information that you provide to buyers of your puppies ? e.g. What do you recommend for food, toilet training, grooming, walking, socialization etc. When you have time, please can you also let me know the following so I can assist in advising owners what to look for and we can also educate other breeders as what to do e.g. I look forward to your input and assistance. I am very disappointed (although not surprised) that you have not replied to my previous email where I have requested you to provide the information re how your puppies are raised, how homes are checked and what kind of information you provide to new owners of your Roodewaal puppies. I guess in my heart I was hoping that what I was consistently hearing about you and Roodewaal was not true. When I tried to call you for the first and only time to follow up on a response to my email, you screamed at me and said I was harassing you. As you probably know, my name is Deborah and I own three gorgeous miniature schnauzers. In August 2014 I launched the Schnauzer Friends South Africa community with the aim to love, celebrate, share and enjoy Schnauzers with a focus on RESCUE. I wanted to share schnauzer information, encourage fun, regular walks and socialisation and I also wanted to help rescue schnauzers in need. We are now the largest Schnauzer community in South Africa with over 4000 Facebook members, a website, Instagram, Twitter and we have a regular newsletter. We hold regular Schnauzer Friends Fun walks in Johannesburg and Cape Town with sometimes over 70 schnauzers attending. I am very proud of our amazing schnauzer community and especially proud of all the rescue schnauzers we have helped across South Africa. I love the smiles and thanks I get from schnauzers and schnauzer parents all over the country. Our rescue moto is #gettingthewagback. Prior to me starting Schnauzer Friends South Africa there was no PLATFORM for schnauzer owners/lovers to chat and share information. I have now provided it. One of the repercussions of owning this platform is that people now see me as the Schnauzer Go To Person "Ombudsmun". Disgruntled schnauzer puppy and dog owners regularly contact me to to complain and Roodewaal Kennels is about 98% of all complaints I receive. The story is consistent - Roodewaal delivers sick puppies that die and then offers to replace the puppy or pay towards the medical bills or the dogs get sick with genetic diseases when they are older. People fall for the Roodewaal glossy ads and your trusting words splattered across all sorts of forums in South Africa and internationally. Just so that all of you can no longer pretend you are not aware of the PAIN you are causing to people and miniature schnauzers - please see pasted below a few of the comments posted to the Schnauzer Friends - South Africa facebook page in the last THREE days alone. Please note that these are the comments that were PUBLICLY posted on a public forum. I am not sharing the comments and emails that I receive privately or in the many months before this. I can tell you that it is a lot and the story is consistent! What really puzzles me is what kind of people choose to make money on out of other people and animals pain and suffering? I also please request you all to visit the Schnauzer Friends - South Africa facebook page and see the comments yourself. I have not made them up. For your reading pleasure I have pinned the post so it will be the first one you see on the page. I am pretty sure more and more comments are getting added as we speak. Then please decide if you want to continue to be part of this? If you are still going to feed puppies into the Roodewaal puppy machine - then please then have the decency to up your game. Stop selling sick puppies and start testing for genetic issues that are passed on to the puppies. Don't take the puppies away from the moms before 8 weeks of age MINIMUM! Feed them better food. Don't turn a blind eye and pretend everything is ok. IT IS NOT!!!!! Start contributing financially to the Schnauzer Friends Rescue program as we rely on donations. Is it fair to expect other people to clean up your mess afterwards when these schnauzers get dumped unwanted at shelters? Bear in mind that Schnauzer Rescue is done volunteers. As I said before Roodewaal feeds our rescue program..... Yip that is you guys!!!! So please read and then reflect on what kind of people you want to be.... Think with your hearts and not with greed! Finally - I would like to offer you another opportunity to explain what has happened here? What is your side of the story? Why are all these people saying these things if they are not true? Why are a lot of your puppies sick? Why are you not testing for genetic diseases? Why do you continue to contract breed when you are aware of these issues. How much money is enough? How do you feel in your heart about robbing your breeding dogs from a happy life in a loved home - but rather lock them in cages day in and day out on your farm? INFO: SAD: I have people reporting the same schnauzer puppy GREEDER over and over to Schnauzer Friends. Today I had two more calls from distraught disappointed schnauzer parents! People are surprised when they get home and the puppy is sick or lethargic etc. one even died today. Don't you wonder why the breeder had puppies available straight away? Did she ask you any questions about where the puppy was going? This greeder has fancy glossy ads and behind the scenes she has hundreds of breeding schnauzers locked up in breeding pens outside and she also contracts out breeding packages to people where she buys the pups back at 7 weeks and sells them to unsuspecting owners! She has no regard to the dogs well being and will sell you a pup with no questions asked. After getting endless complaints I named the breeding kennel on the Schnauzer Friends website a few weeks ago. She threatened me with legal action and I removed it. I am now getting legal advice as we need to name and shame this type of scum. So if you are thinking of getting a schnauzer puppy please visit the Schnauzer Friends website and read the page on puppies. If you support these people YOU are part of the problem!! PS: The kennel name starts with a R! This woman called me endlessly to buy a puppy from her. Upon my request to visit the farm in ermelo she refused . I insisted and she said i could visit on a saturday if i pay R350. And she wont be there to see me. Totally disgusted. When i phoned a couple of other breeders they ALL knew about Elmarie. She insisted that all pups be delivered. Didnt buy from her but it breaks my heart. Yes I know exactly who this women is,we bought a puppy from and 5 days later our hearts were broken because she died from parvovirus. She suffered so much,it killed us. And all she could reply was, sorry this kind of thing happens, I'll replace it for you. Needless to say we never replied and still to this day our hearts break when we think of our baby Marley. She should be shut down. We bought a puppy from this "R" kennel and we have had endless visits to the vet, she also offered to "swop out" the puppy for us, like it was a pair of shoes that weren't fitting probably. I hope this kennel goes down!! Have bought 2 puppies from Elmarie @ Roodewaal. Our first one is an absolute darling. We needed a friend for him, so bought a second one. We had this little pup for 2 nights and he spent his next (and last) 2 nights at the vet before passing away. This puppy suffered terribly. Parvo, distemper, and worms like nothing ever witnessed before! These puppies are paying the highest price....they are paying with their lives and Elmarie continues as if nothing is wrong with Roodewaal! Elmarie said it was the shock of the flight.....what B S!! Shut her down!! She has apparently sold her business.....please .... Somebody....teach this woman a lesson and soon!! We are going to take action from our side. Let's hope and pray that our puppy has not died in pain and in vain. I bought a schnauzer from this breeder I went to the farm I was heartbroken to see the condition of the cages the puppies were in. The mother looked dirty and unkept. I did take a puppy. The puppy did not know what grass was. Ive since bought a 2nd one the difference is incredible . My 2nd one runs and interacts with other people easier than my first. My first is scared of other people interaction happens in the first 9 weeks these puppies do not get any human interaction at all. And it has a direct effect on the dogs personality. I do not regret taking my little puppy I saved it and love her dearly. I wondered the same.... yes if it is this person she has been breeding for many years, wont let people go to her house She delivers to you, you cannot choose your puppy, she matches it to your star sign!!!!! If dogs are being badly treated and there is adequate evidence, I absolutely agree that she should be named and shamed. Why not? It's not defamation. It's a fact. Before we got our boy from Francois at Keystone Elmarie sent us a photo of an available puppy at half the price. It was despicable. He looked sick. And so so sad. Sat in the corner of a cage with faeces and wee all around him. Despicable. It is abuse full stop. And abuse is wrong. Get her inspected by the SPCA and close her down. My darling Zara whoI also got from this breeder, was sickly for the first 6 weeks I had her and spent a lot of time at the vet. When I was looking for a puppy, I came across her, as she advertises EVERYWHERE. When I enquired, I became suspicious when she said she could guarantee a puppy at any time. I must tell her when my ideal day of delivery would be and she could give me an 8week old puppy then. I must also tell her exactly what my puppy must look like and she will provide! How bizarre?!! She asked NO questions about me / my situation. I noticed that the photo she sent me of the puppy was the same photo she's been using on gumtree for months! I'm so glad I trusted my instinct and avoided her. I now have my gorgeous Daisy from a good, responsible breeder! Also, be careful with R because she is friends with the local vet so you cannot get unbiased feedback from him. Now that I actually think about it, the day I bought Andrea she slept the whole way back to her new home. The next day I took her to my vet for a complete check up and also to test the chip. My vet then started her from scratch with her vaccines and deworming. She told me that it's a safe way just to make sure my pup will be healthy. But she also scratched alot and my vet told me it's not fleas but a kennel rash. I almost could not believe it because when I went out to the farm everything was clean. In fact when I got there she was already waiting for me with about 6 pups to choose from. Al of them were clean and nothing seemed suspicious. She let me fill in an "application form" with all my details as well as how many other dogs I had, what breed, how big is my yard and so on. She also refused to give me my baby's certificate. I had to have her nurtured first and only once I sent proof of it she posted my certificate. For now Andrea is healthy and happy.... I just hope it stays this way. I've also bought from Elmarie @ Roodewal and Harley is turning 1 this month. She's healthy and gorgeous. We collected at the farm in Ermelo and shes very proud of her setup. We left with our puppy but weren't happy with situation. We wanted to take all the doggies home. I am really shocked to read all this. When I was looking for a schnauzer I made an effort to find a decent breeder. As I am from namibia it was not so easy except for the Internet. As I was very concerned I phoned them a lot and asked a lot of questions. Everything sounded so great. My little Schnauzer arrived here in Windhoek , save and healthy. The only thing that worried me was, that she was very skinny and very small for her 12 weeks that she was supposed to be. When I phoned them because of that, I was told that is, because she was the smallest of the litter. She is now a healthy and very happy dog but I wish I would have known all of this before. I would never have bought from a breeder like that. Please close her down that not more doggies have to suffer. At least my little angel is saved. They continue to con the public in so many ways : There is one currently telling the story that if you have daughters u must only have " male " dogs n yep you guessed it only male pups available ! Oh I saw the one you mean! Sorry but anyone who buys a pup that is delivered like a sack of potatoes needs to have their head read! Apart from the health issues - what about socialisation? A pup that is used to people and has been brought up in a family environment will be better-adjusted socially. And she obviously know NOTHING about dogs as she recommends buying two pups "if you are going to be out all day". Any dog trainer worth their salt will tell you buying two puppies together is just asking for trouble. Kusa couldn't care as long as they pay their annual fee. There is no control over these despicable greeders. Money is what counts not the animals. To have parvo in a kennel is extremely difficult to get rid of. "toe ons hulle kry was die een puppy heel lomp en vallerig kan nie regop staan nie"
"Hy het gestink. Sy vel was so ontsteek hy was vir 6 weke op antibiotika en 6maande op voorskrif hondekos. Hy moes weekliks gebad word met medicated shampoo. Dit was n bitter duur oefening! Toe ek haar konfronteer per e-pos oor die swak voeding het ek nooit weer iets gehoor van hulle nie"
"a client of mine bought 2 pups from R Kennels and one died or had to be put to sleep 2 days later." "One of the schnauzer mom who bought from R-Kennel had her pup die within a day and then a new one was just sent to her, like a replacement.!" Having read the email, you can no longer pretend that you are not aware of the PAIN you are causing to people and miniature schnauzers. Don't turn a blind eye and pretend everything is ok. IT IS NOT!!!!! For your reading pleasure I have pasted below a few MORE of the comments posted to the Schnauzer Friends - South Africa facebook page in the those same THREE days alone. Please note that these are the comments that were PUBLICLY posted on a public forum. I am not sharing the comments and emails that I receive privately or in the many months before this. I can tell you that it is a lot and the story is consistent! I also please request you all to visit the Schnauzer Friends - South Africa website and see the comments yourself. I have not made them up. For your reading pleasure I have linked the facebook post to the bottom of the puppies page at the bottom. If you click on it you can peruse the comments at your leisure. If you are still going to feed puppies into the Roodewaal puppy machine - are you going to have the decency to up your game ? Are you going to stop selling sick puppies and start testing for genetic issues that are passed on to the puppies. Are you going to stop taking puppies away from the moms before 8 weeks of age! Are you going to start contributing financially to the Schnauzer Friends Rescue program as we rely on donations. Is it fair to expect other people to clean up your mess afterwards when these schnauzers get dumped unwanted at shelters? Bear in mind that Schnauzer Rescue is done volunteers. As I said before Roodewaal feeds our rescue program..... Yip that is you guys!!!! Also I am STILL extending my offer of an opportunity to explain what has happened here? What is your side of the story? Why are all these people saying these things if they are not true? Why are a lot of your puppies sick? Why are you not testing for genetic diseases? Why do you continue to contract breed when you are aware of these issues. How much money is enough? How do you feel in your heart about robbing your breeding dogs from a happy life in a loved home - but rather lock them in cages day in and day out on your farm? Ek is geskok wat ek sien.. ek het my zorro en roocky ook by haar gekoop... so waar wat n hele paar mense hier bo se sy het vir my ook al die goed gese. As ek maar van beter geweet het... En haar besigheid is baie professioneel op internet.. ek het laas jaar 2 puppies gekoop by haar en sy het hulle op die vliegtuig gesit kaap toe.. toe ons hulle kry was die een puppy heel lomp en vallerig kan nie regop staan nie. Ons het hom Vet toe gevat later die aand en hy was toe siek, vergroting in sy binnekant van stert en kan nie poo nie en hulle moes hom toe uitsit.. Nie gesond geklink nie... die vet het vir haar laat weet en sy het gelukkig die koste gedra en sommer die volgende dinsdag n nuwe puppy gestuur.. ek kannie glo wat ek sien in watter omstandighede my puppies kom nie.. hulle velletjie was ook nie gesond nie en moes baie behandel word.. zorro en roocky word junie maand 1 en ek is baie bly ons kon hulle baie liefde gee en dat hulle sover mooi gesond is.. I have a home-from-home doggie boarding facility and a Client of mine bought 2 pups from R Kennels and one died or had to be put to sleep 2 days later. This is so horrible! I am a Yorkshire Terrier breeder and it breaks my heart to hear these stories! My babies live in my house, sleep in my bed ( they rule my house) and are a big part of my family. I adopted two of my females also from kennel breeders (greeders). they where not producing big enough litters or where bad mommy's. I rescued them before they where put to sleep. It took me nearly a year to adjust in my household. Today they are retired, staying on the farm with me and are the most amazing animals!! I breed for the love of the breed and animal!! Keep up the amazing work Schnauzer Friends - South Africa I will try my best to help in any way with donations! So tragic - can people be so greedy that they have no respect for a poor animal - disgusting! They should burn in hell. These breeders are disgusting human beings !!! If Parvo is an issue it is serious and the SPCA should be able to step in and shut her down. It sounds like a nightmare for these poor dogs. If only animals were considered more than just a passing amusement or a quick and easy money making scam! Anyone who wants to be a breeder of any animal should have to undergo a stringent screening process with regular follow ups to check the health of their animals, ensure a clean, safe and loving environment and control the number of animals on the property and frequency of breeding. I would definitely approach the Animal Welfare organizations and see if they can help. I have schnauzer boarders. One of the schnauzer mom who bought from R-Kennel had her pup die within a day and then a new one was just sent to her, like a replacement.! This is so sad. Makes me so angry. Our dogs give us so much love, that it is impossible to understand how anyone can treat them like machines. You continue to ignore our emails and phone calls, but we will continue as we are the voice for the animals that unfortunately do not have a voice of their own. I know that many disgruntled people who you have hurt over the years are starting to contact you on the phone, email and facebook etc. as they are realizing that their "sick" puppy from ROODEWAL was not an isolated case. You knew your dogs were sick and compromised and yet you continued to sell the dogs. You knew you had PARVO on your farm and at some of your contract breeders and you carried on breeding and selling these puppies! I am absolutely sickened by what type of person would do this. I know that you have been breeding for 30 years, and I am too late and that you were planning to move from your farm anyhow as you are getting old. What I would like is for people to know the TRUTH about what you have been doing behind the glossy ads. How can you treat animals and people like this? There are many many people behind us with this. We have a lot of information and are preparing the info packs for Carte Blanche, KUSA, Ban Animal Trading etc. I have legal people on board and others offering assistance. You have dug a hole very deep. For so long you have somehow successfully managed to intimidate anyone who questioned your breeding practices with threats of legal action. Now there is social media and you are being exposed as information is very easily shared. Just for your info here is my latest facebook post. I have also had extensive legal advice and I am perfectly in my rights expressing my opinions and sharing info to the Schnauzer Friends community regarding this. AGAIN - I would like to offer you another opportunity to explain what has happened here or would you rather speak to Carte Blanche etc? What is your side of the story? Why are all these people saying these things if they are not true? Why are a lot of your puppies sick? Why are you not testing for genetic diseases? Why do you continue to contract breed when you are aware of these issues. How much money is enough? How do you feel in your heart about robbing your breeding dogs from a happy life in a loved home - but rather lock them in cages day in and day out on your farm? I am mostly curious what drove you to do this? None of these emails were ever answered ...... So sadly we will never know!